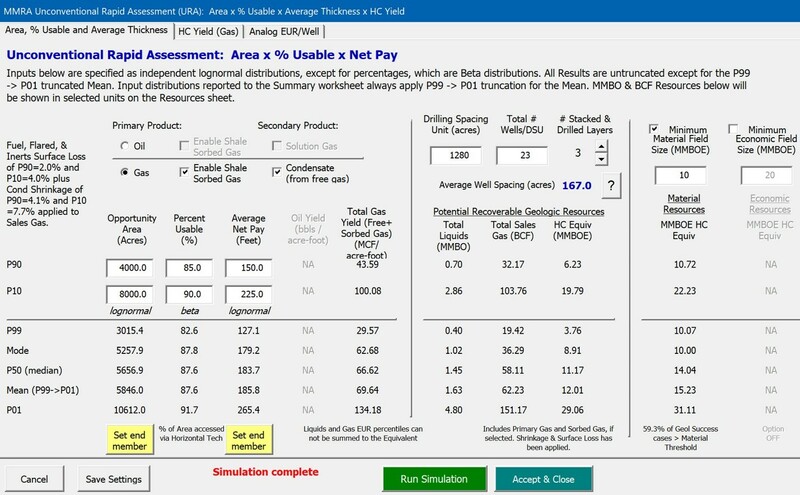 Unconventional Rapid Assessment (URA) is an Excel VBA-based screening tool that facilitates the assessment of resources and chance of low permeability opportunities. Users may capture all relevant header data and use robust volumetric methods to calculate resource estimates for in-place and recoverable primary liquids, gas (including sorbed gas), and associated solution gas or condensate. High-side and low-side inputs are captured for Area and Average Net Pay assuming a lognormal distribution shape, while Hydrocarbon Yield components are input on a second tab using a combination of Beta and Lognormal distributions. The simulated HC Yield and prospect Resources are displayed. Figure 1: Resource Simulator with optionality for Shale Sorbed Gas, Solution Gas. Resource estimates can be provided by DSUs, Layers, and at the Well Level. Additional tabs enable the input of the Yield components. Analogs may also be entered to compare current vs. analog for both well and the total opportunity. Figure 2: Metrics for the assessed play are provided for comparative purposes with other projects. Both In-Place and Recoverable Resource (not shown) ranges are provided. 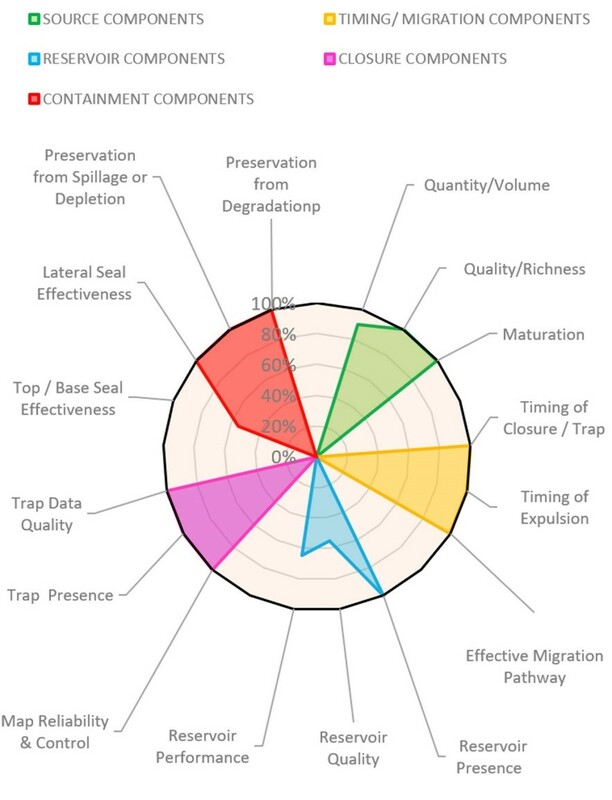 Simulated distributions for In-Place and Recoverable Resources for all selected products are provided in several different chart formats and can be quality controlled as comparisons to analog resource inputs from historical data or type-well decline estimates. Commercial and economic truncations have also been included in the example below. The full range of input data and resultant output for every trial in the simulation is available to the user. This supports the use of the tool to address key issues such as determining how proposed well spacing varies with forecasts of EUR and Productive Area and enables communication with engineers, planning and portfolio functions regarding potential development scenarios for exploration opportunities. For helping to characterize and compare opportunities, URA captures estimated ranges for key criteria contributing to the geologic and productivity quality of the prospect. Separately capture qualitative weightings and rankings for those criteria to assess the cumulative aggregate ranking of the opportunity via an Opportunity Index score. 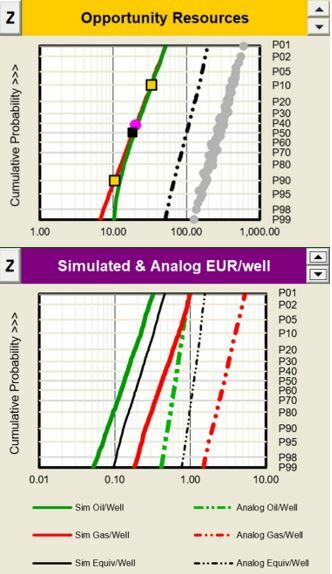 Users may also populate measurements for all key criteria to estimate the geological chance of encountering producible hydrocarbons checked against a defined minimum to determine the chance of adequacy for that chance sub-component. The evaluation process provides an overall chance of geological success for the prospect. All inputs and outputs tables and graphical results can be automatically built in a PowerPoint file. Following the initial evaluation of the opportunity in URA, further rigorous evaluation is facilitated in ProjectRA, which models a series of staged investments from Exploration, Appraisal and Economic Demonstration through Development to determine the economic viability of the project. It builds production, revenue, capital and opex over time based on modeled production type curves and drill timing. ProjectRA provides numerous methods and tools for the user to forecast and understand the aggregate average resource per well given limited data sets along with discounted economic metrics. When populated, a company may leverage Appra to capture the opportunity URA details for all assessed opportunities facilitating quality control and comparison. Appra will follow your approval processes as a project moves through various stages. Along the way, Appra will formally record assurance reviews and reports and drilling decisions. PortfolioRA may be used to evaluate the probabilistic aggregated resources and number of prospect discoveries for multiple opportunities.